It's that time of the year again when the Christmas trees start going up and it's gingerbread everything, but that also means that finals have approached us. I like to call this week, "hell week," because that's exactly what it is. As much as I want to indulge in the Christmas festivities, I've got to keep my eyes on the prize: good grades on my finals. How do you stop yourself from going crazy though? Good grades are important, but so is your sanity. Make sure you're taking time for youself. If you're stressed out and overwhelmed then you won't do well on your finals. 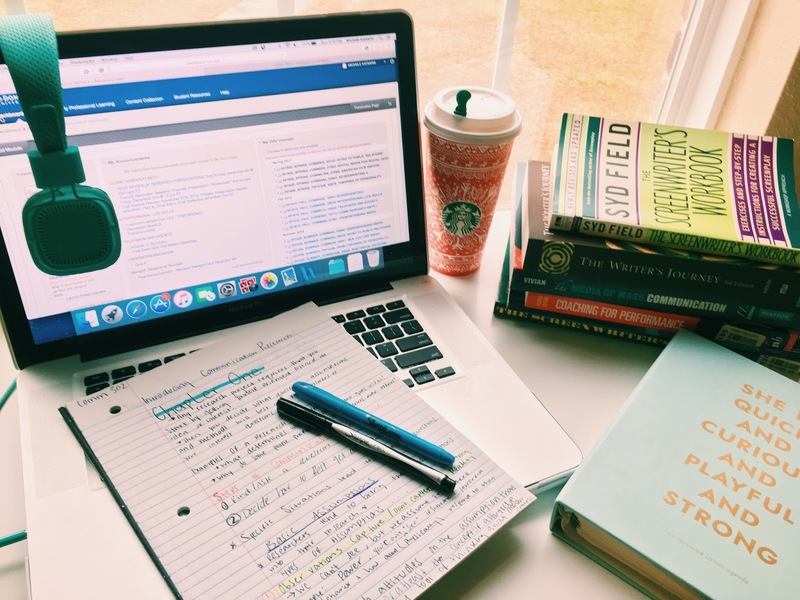 Here's some helpful ways to help you get through finals without losing your mind. One. Get Some Fresh Air // I'm lucky enough to have a huge fluff ball named Oliver that has to go for multiple walks a day. This is when I get some fresh air to clear my head. Even if it's just to check your mailbox, just take a minute to walk outside and stretch. Two. Reward Yourself // If it's a Starbucks Venti Mocha Frap with Non-Fat Whip, then so be it! Whatever it is, just get it. Reward yourself with that $4 cup of deliciousness while you cram the different body part names in your head. Three. Find Your Study Area // If it' at the library, your bedroom, or local coffee shop- just head that way. Make sure it's a place that you can't get distracted and you can stay focused. Four. Exercise // Some people enjoy yoga, some like to run. It doesn't matter if it's for ten minutes or an hour. Take time from your day to get all that stress out. If you start your day with a workout or you end your day with one, it's the best stress relief. Five. Have a Creative Outlet // Sometimes you need to take a break from the educational side and focus on your creative side. If you like to draw and color then do just that. I personally love to blog (incase you can't tell) and this was a nice break from the ten page paper I was writing. Six. Have a Cut-Off Time // I know not everyone can work from home. I understand some people have morning shifts so they have to do their homework and study at night. What's important though is to have a time that you shut down everything and relax for the night. Despite what everyone believes, staying up until 3am and studying when you have a 7am test is not beneficial. Once you have your cut-off time stick to it and shut it all down. Obviously, submit any homework and final exams you have for the night. Once you put it all away it's time to deteox. Have a bubble bath, throw on comfy sweater, light some candles. Detox your mind and body and rewind from the stressful day and go to sleep in a happy state of mind. How do you get through finals? I would love some tips!